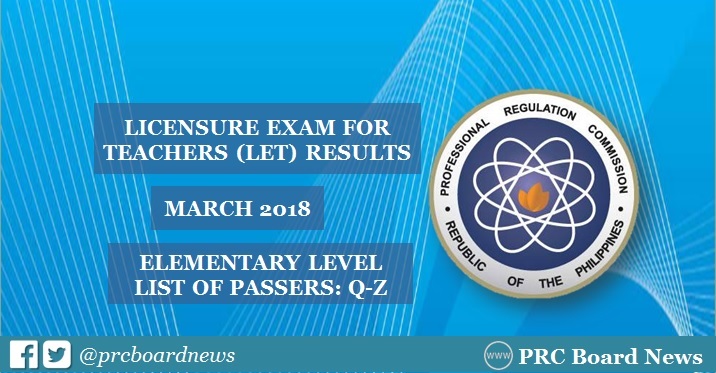 MANILA, Philippines — The long wait for the official LET result is over as the Professional Regulation Commission (PRC) release on May 23 (Wednesday) the full list of passers, top 10 and performance of schools for Elementary Level. The examination was conducted in at least 20 testing centers nationwide: Manila, Bacolod, Baguio, Cagayan De Oro, Catarman, Cebu, Davao, General Santos, Iloilo, Kidapawan, Legazpi, Lucena, Occidental Mindoro, Pagadian, Palawan, Romblon, Rosales, Tacloban, Tuguegarao and Zamboanga. Per PRC Resolution No. 2017-1068, LET result is target for release on Tuesday, May 22. Recent updates from reliable source confirmed that results will be released this week, particularly on May 23. In the same period last year, results were released in forty (40) working days after the exam. A total of 5,600 elementary teachers out of 53,915 examinees (10.39%) and 18,482 secondary teachers out of 72,584 examinees (25.46%) passed the exams. kelan po release ng LET result? SAAN NA PO?